The only modification I made was making a smaller cake. I knew I was not going to eat the cake (it has fruit in it), and there was no way Tom was going to be able to eat such a big cake all to himself, as much as he tried. And since the cake has a heavy love affair with whip cream, it needed to be eaten fast so I made half the recipe, in order to come up with a smaller 6x3 cake. Step 1: Sour Cream Pound Cake - The recipe is made with eggs, sugar, oil, sour cream and flour. Did you notice that I did not mention butter? This is the first time I make a pound cake with oil and I had a bit of a “whattt??”moment. How can you call this a pound cake and not use butter? (It’s sad when I tend to stick to baking stereotypes). Ms. Krasne sure showed me, because baking a pound cake with oil is totally ok. The cake baked beautifully – I did not even encounter the rounded or cracked top that the recipe mention may happen. It was tall, flat and perfect. Step 2: Vanilla Simple Syrup – Sugar, water, vanilla extract. Done and Done. Step 3: White Chocolate Sour Cream Mouse – I think I have mentioned before what a huge fan of chocolate I am – love the stuff. White chocolate? Not so much. It just tends to be overly sweet and I’m just not a fan. So when I started on this step, I was hoping that the results did not end as a pucker up sweet mouse. Once more I was proven wrong. The mouse is simple enough to put together – hot cream, into chopped white chocolate, let it melt, stir and then add sour cream, put in refrigerator to chill and you are done. End results – amazing taste, the sour cream really does the job is killing the sweetness of the white chocolate, giving you a very sophisticated combination of sweet and tart. Step 4: Assembly – the only extra step is making the whipped cream and adding the fruit – did I mention its full of berries? Strawberries, raspberries, blackberries and blueberries were the stars. Like the previous cake I made from this book. We assemble the cake using the cake pan and created layers of cake, soaked with syrup, added some of the mouse, covered that with freshly whipped cream, added the berries and then did it 2 more times. End results 3 layers of yummy. And a very tall cake – so much for making a smaller cake! As 90% of these cakes in the book, it goes into the freezer for a 24 set in order to be prep for the last step - décor. 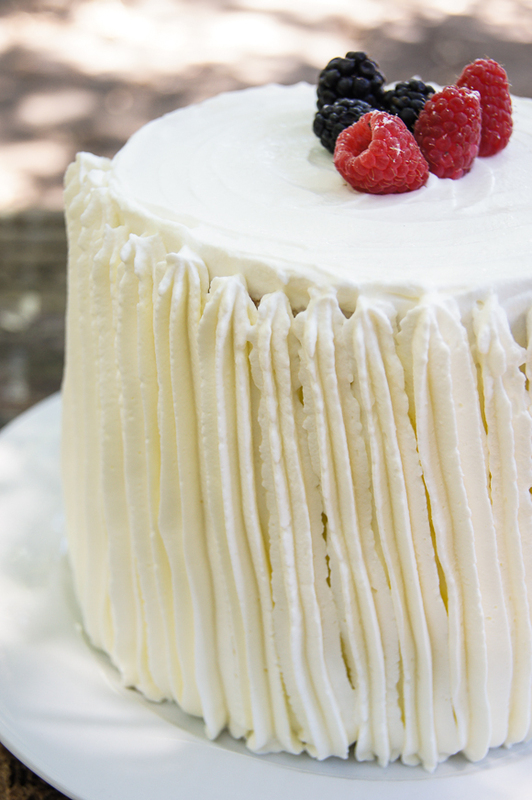 Step 5: Décor – Once more, heavy cream got whipped up with some sugar to use in order to cover the cake. And white chocolate shavings would top the cake. As my picture shows I did not use the white chocolate as a topper. I was serving the cake for dessert at our lunch and I was pressed for time, instead I added some berries, sprinkled the top with some powdered sugar and called it done. Back in the refrigerator it went to thaw out. Tasting: This cake, oh boy. This cake is just amazing. And this is coming from a non- fruit-cake eater. But, I had to taste it, it just look too inviting and it did not help that my husband and mother were letting out sounds of pleasures when they were eating their pieces. Once I took the first bite, it had me. The flavors were perfect, did not compete at all with each other, I actually love the cake (wait, the sky open up and I think hell may have frozen a bit) fruit and all. Maybe because the fruit was not cooked? Who cares? I think we may have to place this in our top 10 cakes that will be done over and over. Tom already suggested it for his birthday cake request. Note: No recipes will be shared in my Extraordinary Cakes posts, due to copyright restrictions with the publisher. I encourage you to support our author andbuy the book here. To see our creations, we have aPinterest boardandFacebook groupto share our experiences. If you happen to have the book and fancy joining us in our little pack, we are baking one cake a month, let me know via email and will send information.